You can check out the other guidelines available from AHA/ACC here. All files are free downloads. You have to download the Pocket PC (or Palm) version from Skyscape. The downloaded file is the standard installer, used by the other Skyscape applications, like Archimedes. 1. Patient risk - a patient with CAD S/P CABG with CHF is clearly at a higher risk than a patient who has only HTN. 2. How well is the patient prepared for surgery? What is his activity level (measured in METs)? The most useful question is "do you have stairs in your house?". If yes, "can you climb a flight of stairs without SOB or CP?" Going up and down stairs will give the patient a MET of 4, which is the dividing point in the algorithm to consider cardiac testing. Just remember "stairs = MET 4". 3. 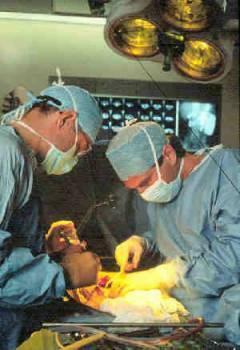 Surgical risk - a high risk procedure, like AAA repair vs. a low risk procedure, like breast biopsy. 4. Select the tests to perform. EKG is almost always indicated. Follow the algorithm to decide which patient needs a stress test. After you look into these 4 variables (PASS), you have to follow the AHA/ACC algorithm. Of course, there are many other things to address, like when to stop and restart certain medications, etc. This is the basic approach which is the backbone of the perioperative evaluation. DTI prognostic accuracy is 81%. DSE has the additional advantage of showing the systolic function, the accuracy is similar to DTI. The majority of patients have intermediate or minor clinical predictors, and you can use the following shortcut to determine who needs a stress test. If a patient has 2 out of 3 of the above variables, he or she will need a stress test before the surgery. Note: The "HIP" shortcut is valid for patients who are scheduled to have high risk or intermediate risk surgery. Patients scheduled for low risk surgery can usually proceed with the operation without the need to have a stress test first. 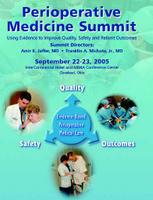 The summit, conducted on September 22-23, 2005 included more than 200 physicians, and was a resounding success. 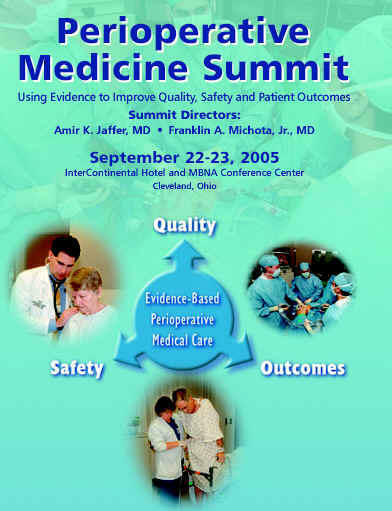 Summit directors were Dr. Jaffer and Dr. Michota. Several members of the hospitalist team presented lectures and case discussions during the two-day event. Proceedings of the Perioperative Medicine Summit were published in a special supplement of the Cleveland Clinic Journal of Medicine. Using beta-blockers to cut perioperative risk in CAD. Postgraduate Medicine, 12/05.